Poetry is almost always intended to create a connection with the reader. But can a poem form an immediate bond between the living and the dead? This certainly seemed to be the case when I first read “Electric Bill” by David Perkins in a collection of Kansas City poets from the 1970s. 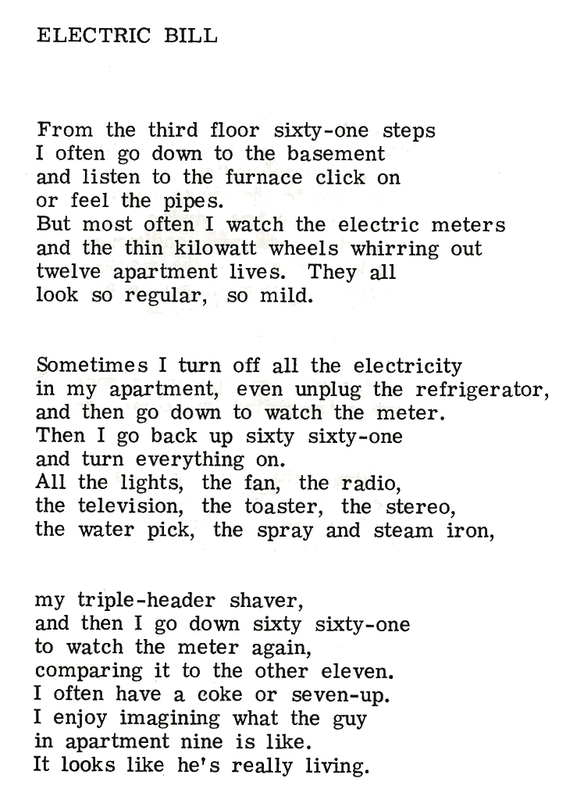 On its surface, “Electric Bill” is a fairly uncomplicated poem about someone who marches up and down the stairs of an apartment building, inferring about the lives of those around him by watching their individual electric meters. Like the poem’s speaker, I too lived in a third-floor apartment, spending my share of time in the expansive, haunted basement changing fuses for the frequently out-of-town landlord. While first reading the poem, I was almost certain the amount of stairs between my apartment and the basement were the same as in the poem (they weren’t, but it was close). The speaker’s odd, amusing behavior in “Electric Bill” reminded me my own pacing through the century-old colonnade which I lived in and wrote about as if it were a living entity, often speculating about the others who called it home. I even double-checked the authorship of “Electric Bill” to make sure it wasn’t something I’d written and inserted in this now-dated volume by mistake. After a few more months in our third-floor apartment, Jennifer and I decided to look at a few houses before the new homeowner tax credit expired. Among the mostly unappealing bungalows we looked at was an old white house near Loose Park that had belonged to a man who died just months before. Hardly any of his things remained except a few empty cylinders of Scotch in the basement and a box of books in the closet. While walking around the porch I saw a woman I worked with, who told me she had lived across the street for 30 years. “So you’re looking at David’s house?” she asked, telling me how much they liked the neighborhood. Before we left, I waited until the real estate agent went to lock the back door and then I ducked into the bedroom with the closet full of books. Inside were about a dozen copies of a collection of essays and a stack of chapbooks of poetry — both of them authored by David Perkins. I tucked one of each in my jacket and bid the house farewell, not especially smitten with the real estate but suitably impressed with the synchronicity. He’d been to my place, and now I’d been to his. I have since learned that Mr. Perkins was an active writer in the Kansas City area and the longtime editor of the Chouteau Review, a much more established journal than Kawsmouth but not at all dissimilar in spirit and purpose. The Missouri Valley Special Collections at the downtown Kansas City library contains a bound copy of the material Chouteau Review published during its tenure between 1975-1985. Among it are poems, photographs and at least one essay discussing whether Kansas and Missouri poets rely too heavily on Midwestern themes. 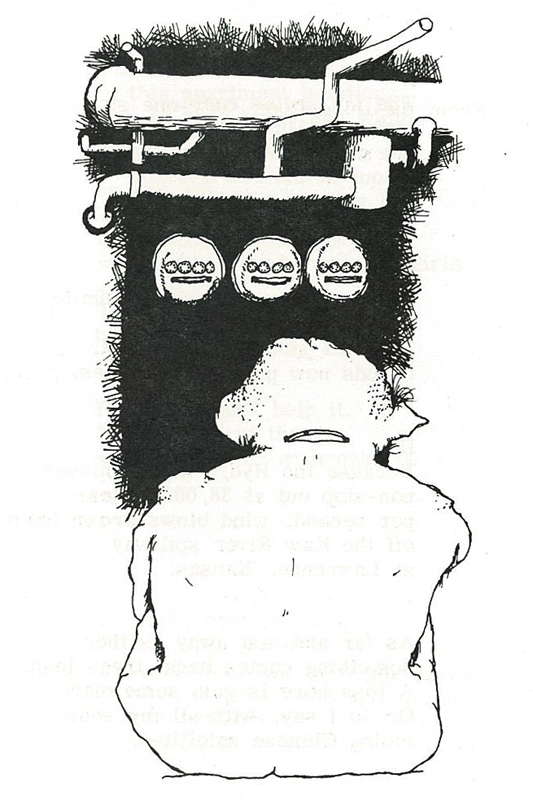 To make the Kawsmouth/Chouteau collection official, we’re including a scan of “Electric Bill” in this issue as well as the accompanying drawing by Mark Roeyer. We’re doing so with the implied permission of Cottonwood Press, which published Perkins’ and Roeyer’s chapbook, Midget Wonder, in 1971. If anybody has any objections or further information, please let me know. And if decades from now you come across my poems in some fusty closet or cached-out corner of the Internet and would like to publish one of them somewhere, please be my guest.